Denne halvdagstur er en flott introduksjon til byen for første gangs besøkende, og en glimrende måte å få mest mulig ut av Barcelona på et kort opphold. Inkluderte hotellvalg og avganger gjør det ekstra praktisk. Ta en intim sightseeingtur i Barcelona under denne helpassede halvdagens private guidet tur. 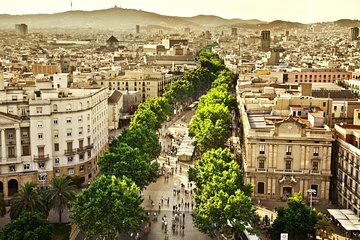 Denne lettutviklede utflukten er den perfekte måten å sjekke ut den ikoniske byen Barcelona med en kunnskapsrik guide og privat transport, tilpasse besøket ditt for å matche dine interesser. Start din private omvisning i Barcelona ved å møte din guide på ditt hotell på en forhåndsbestemt tid som samsvarer med timeplanen din. Deretter klatrer du inn i ditt private kjøretøy ettersom du legger deg til din første stopp på dagen. Du er velkommen til å velge nettstedene du vil besøke under turen, eller la veilederen velge dagens planlagte stopp og attraksjoner. Underveis, fordyp deg i den fascinerende historien og spennende arkitekturen og fargerike karakterene i Barcelona, som din guide deler historier og detaljer om byens fortid. Turen kan ta deg til den berømte katedralen Sagrada Familia, designet av den verdensberømte arkitekten Antoni Gaudí. Denne omfattende religiøse strukturen er fortsatt under bygging mer enn 130 år etter at arbeidet begynte. Eller gå til Gaudís populære Park Güell, en fargerik park bedecked i detaljert keramisk tilework satt i åsene over Barcelona. Du kan også sjekke ut Gaudís to mest ikoniske hus, Casa Batlló eller La Pedrera, som ligger i Barcelonas Passeig de Gracia-boulevard. Historie elskere kan velge å fokusere på byens atmosfæriske gotiske kvarter (Barri Gòtic), hvor du kan gå blant de gamle bygningene og veggene fra den romerske og middelalderske epoken og se den intrikate katedralen i Barcelona fra det 14. århundre (Catedral La Seu). Eller gå til den berømte vandrepromenaden La Rambla, hvor du kan sjekke ut de mange streetartister, tapasbarer og butikker som strekker sine travle gater. Valget er opp til deg. To flere alternativer inkluderer det berømte Montjuic-fjellet, og tilbyr flott utsikt over byen og muligheten til å se mange strukturer bygget for OL i 1992, samt Picasso-museet, som er vert for en imponerende samling av kunstnerens arbeid. Vær oppmerksom på at noen monumenter som katedralen, Casa Batlló, Casa Mila, Sagrada Familia og Picasso Museum kan kreve inngangsgebyr, som ikke er inkludert i prisen for denne turen. Perfect excursion! Our guide was knowledgeable and provided excellent information, history, and commentary. We really enjoyed this tour! I thought the tour guide was very knowledgeable, however, after reading all the reviews I was expecting the tour guide's English to be a bit better. He was fairly hard to understand and he even commented that he typically did tours for groups that spoke Spanish, so I'm not sure why he was assigned as our guide. Additionally, the Viator site specifically stated that the tour company would contact me in advance to discuss a customized tour, however, they didn't, so we basically just went only to the places that he wanted to take us as, again, it was too difficult to explain to him where we wanted to go due to the translation/language barrier. Sonja was great. Very flexible. Let us choose what we wanted to see. After that, she had some very good suggestions. We really enjoyed the views from Montjuic. Much better than the Sagrada view. rest of our trip. Loved the historic perspective of Barcelona's rich past. Our tour guide and driver were fantastic! Squeezed in all that we asked for and gave us excellent advice on what we shouldn't miss ! Susannah was our guide and Jordy was our driver. Both were very professional, and we felt very safe, even though there had been a terrorist attack in Barcelona two days before in Las Rumblas area. They took us to ALL of the sights of interest. I had a foot problem and couldn't walk long distances, so Jordy made sure that we could park as close as possible, then Susannah was able to take my husband on longer walking areas. It was very enjoyable and we felt we got a wonderful overview of the city! This was a great way to spend the afternoon in Barcelona. We booked this tour in order to see the highlights of Barcelona and become better acquainted with the city while visiting. We arrived the day before our cruise so this was a perfect way to see the highlights with a private driver and tour guide who walked with us and shared her knowledge with us while sightseeing. Absolutely awesome! We had our own van for a family of 6. We had a driver AND tour guide who were so friendly and accommodating! They answered ANY question we had about Barcelona, Spain, Europe, etc and we had tons. They showed us all the main places we would want to see in Barcelona in a short amount of time. Any place we wanted to go they took us and translated for us as well. I would recommend this to anyone!! The half-day private sightseeing private tour we booked through Viator really exceeded our expectations. Even though we only had 4 hours, we felt that we were able to see many amazing things and appreciated Sonias great guidance. The driver was also excellent and very professional. We were pleased that Sonia and her driver were at our hotel early and ready to start us on our tour. She allowed us to customize the places we wanted to go and offered advice as to what would be best to see with her and the driver versus seeing on our own later. Because she is a professional tour guide, she was allowed special access to the attractions. Sonias historical and societal perspectives were great for us as we learned more about the city. We felt welcome by her warm and genuine personality. We only wished we had booked a longer tour, but now we have a reason to come back and will certainly request Sonia!